Last spring, in approving the study topics for the 2018 interim, the Legislative Council approved an interim committee to evaluate the findings and recommendations from the 2018 Legislative Workplace Study requested by the Executive Committee in December of 2017. Speaker of the House Crisanta Duran chaired the committee, and Senator Beth Martinez Humenik was the vice chair. The other persons appointed to the committee were Senator Bob Gardner, Senator Dominick Moreno, Representative Kim Ransom, and Representative Faith Winter. The committee met five times over the course of the 2018 interim. The primary charge of the Legislative Workplace Interim Study Committee (Study Committee) was to make recommendations to the Executive Committee of the Legislative Council (Executive Committee) regarding the legislative workplace. Specifically, the Study Committee considered changes to the workplace harassment policy set forth in Rule 38 of the Joint Rules of the Senate and House of Representatives, the General Assembly’s workplace harassment policies, and the legislative human resources staffing and structure and looked at ways to promote cultural change regarding harassment in the workplace. Through the five meetings, the Study Committee heard testimony from experts in human resources, workplace harassment, and workplace culture and developed recommendations on each of these issues. Some recommendations were approved unanimously. In other areas, the Study Committee included alternative recommendations for the Executive Committee to consider. The Study Committee unanimously recommended that an Office of Legislative Workplace Relations (new office), consisting of at least two full-time employees, be established in the Office of Legislative Legal Services. The Study Committee recommended that the new office have locations in both the State Capitol Building and in the Legislative Office Building at 1525 Sherman Street and that the offices have doors opening directly into a public hallway to help maintain the privacy of individuals entering the offices. Measures to prevent retaliation against persons involved in an investigation. The members of the Study Committee proposed different structures for overseeing formal complaints against legislators and partisan staff. Some members recommended a joint committee composed of four legislators—one from each caucus—and three non-legislators. The non-legislative members would be appointed jointly by the leaders of each caucus and would have experience in human resources, victim advocacy, and employment law. Other members recommended establishing separate workplace harassment committees for each chamber consisting of three members from each caucus of the chamber. The committees would include only legislators and could solicit testimony from experts as needed. 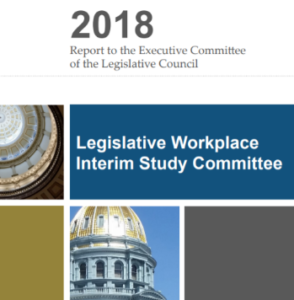 The Study Committee made recommendations to amend the Colorado Open Records Act to protect documents related to complaints under the policy and recommended changes to the Open Meetings Law to protect the deliberations of the new workplace harassment committee or committees. The Study Committee also recommended that the amended Joint Rule 38 direct the new office to develop a Workplace Expectations Policy, which would establish general expectations for a respectful workplace and address complaints related to those expectations. Complaints under this policy would be resolved through an informal complaint process similar to that included in the proposed new Workplace Harassment Policy. In addition to the new policies, the Study Committee recommended adoption of an interim policy, which would incorporate into the existing workplace policy all recommendations that could be added without making changes to Joint Rule 38. These changes include requiring contacts to alert the human resources administrator to any complaints, allowing the human resources administrator to consult on issues related to workplace harassment, strengthening the anti-retaliation provisions, and clarifying record-keeping obligations. The Study Committee adopted a report of its recommendations at its final meeting on October 11, 2018. The Executive Committee met on November 8, 2018, and unanimously adopted only the interim policy. The remaining recommendations, which require legislative action through resolutions or bills, will be submitted for consideration by the Executive Committee that consists of the new legislative leadership chosen by the caucuses after the 2018 election. The full report of the Study Committee, including the new interim policy, is available to the public on the Study Committee’s website. Next Post: 2019 Bill Request Deadlines Quickly Approaching!